The Northern Mockingbird is a pretty gray bird with white stripes on the wings and tail feathers. The Mockingbird is about the size of a Robin with a smaller head and slightly longer curved beak and long legs and tail. In flight the white underside and dark wing span (catch my eye and) this show of white tells intruders in his territory to leave. This beautiful bird feeds at the feeder along with the Nuthatch, Titmouse, and even Chickadee right now in my garden. The Northern Mockingbird is found in the Southern United States and up through New England (up to Maine) across to the west to Illinois, lower half of Iowa and borders of Texas and Oklahoma. 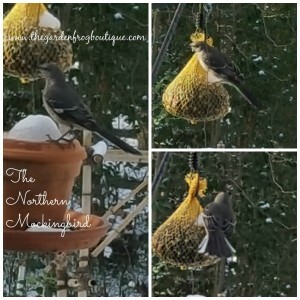 The Mockingbird is territorial especially during the late winter in the south when the males start to build the nests (males start to build the nest with twigs and later the mate finishes with moss, leaves, and even animal hair). The Mockingbird nest can be as low as 3′ above the ground in a bush and as high as 10′. The Mockingbird is a fierce bird and will attack cats and humans if you venture too close to the nest. I have a Northern Mockingbird in my backyard that sometimes gets me confused when he starts singing the songs of other birds. The Mockingbird imitates other tweets and chirps of birds around him. I usually figure out it is him because he sings the ‘song’ longer than the bird he is imitating. 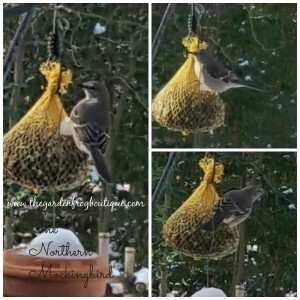 I am having a blast watching the Mockingbird at my winter feeder grabbing the safflower seeds out of the suet feeder. Mockingbirds usually eat insects during the spring and summer and then switching to berries and other wild fruits found in the woods. 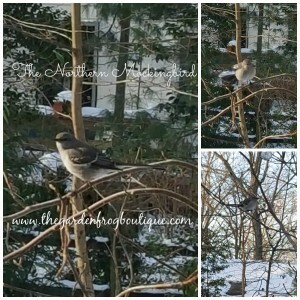 I feed the birds when snow is on the ground and when I am trying to capture pictures of my feathered friends. I am very careful, since I have cats, to keep the feeders far enough or in a spot where the cats cannot prey and capture these beautiful creatures. The Mockingbird is most likely near you in wooded areas, parks, and suburban areas. The Mockingbird loves to sit high above his territory singing his song which can be made up of many different bird songs. As with most birds who may chirp, chirp, chirp a Mockingbird will continue on with a several other bird songs off and on all day and even at night. The Mockingbird is truly an amazing bird to watch and listen. Thank you for stopping by and I know these are not the best pictures and soon I hope to buy a new camera so I can stalk my feathered friends and capture them in better resolution. Let me know if you have a Mockingbird visiting your yard. Great pictures. I wish I had some winter birds here in my yard. We have lots of birds in our Georgia garden, but I haven’t seen a mockingbird in quite a while. Thanks for a great article.